I’m standing at the bus station in my local town and I can feel the emotion rising. ‘Oh my God’, I think to myself, ‘I’m going to bloody cry’. It’s a strange feeling living in a foreign country waiting for your first family visitors to arrive. It’s literally like your old and new worlds colliding. You love your ‘new’ but want the ‘familiar’. You desperately want them to like what they see, and to grasp – even in some small way – what and why it is you love living here. Turns out, there was nothing to worry about. 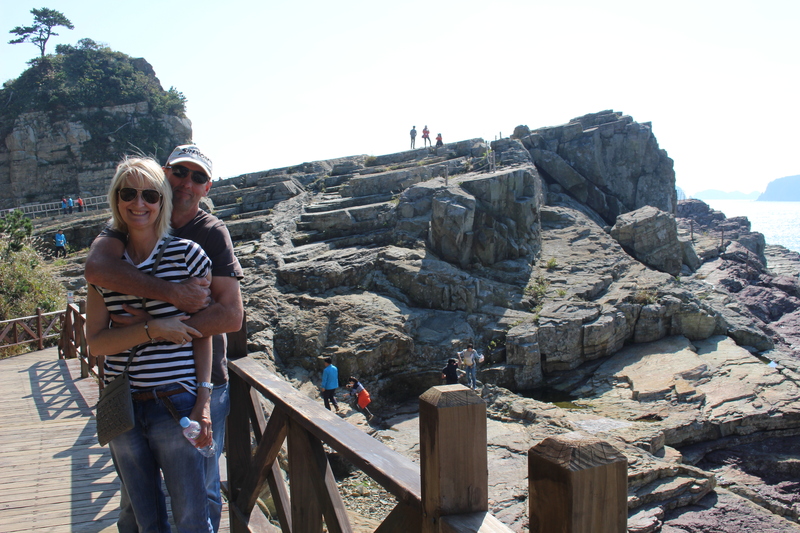 My aunt and uncle embraced Geoje Island with the same wonder and enthusiasm that we did when we arrived – and still do. The first day was all about setting the context for the rest of the week. This effectively meant Boz Scaggs and Ricki Lee on iPod rotation (thanks to my uncle’s new found obsession for both), copious amounts of sparkling, red wine, Soju and Jim Beam and lots of laughter. It was typical first night madness. Before then and despite the gloomy weather, we donned rain coats and wandered our local neighbourhood. I was able to point out how shops leave their merchandise out over night without any fear of theft. And no tour is complete without a trip to what we call, our local IGA. It’s here where the frozen food section is full of bags of chicken feet (boneless though, which is a real bonus), pig’s head, trotters and entrails, and dim sum (okay, that we do like) and where your deli section is full of kimchi and really weird seafood (even better when it’s dried apparently!). Paul had already spied dozens of stores and street stalls selling food on a stick that he was keen to try. Over the coming week, he would volunteer often to do the supermarket run, so he could sneak in some foreign food type on a skewer. 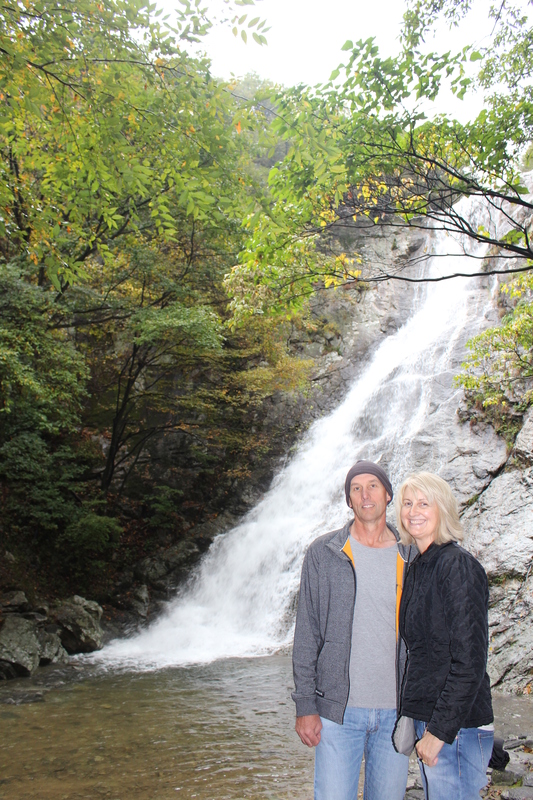 The weather had taken on a moody, autumnal tone so it seemed only natural that we walk up to Mudong Falls. Heavy rain in the previous two days meant that the falls were gushing at great volume, making for a spectacular walk and view. 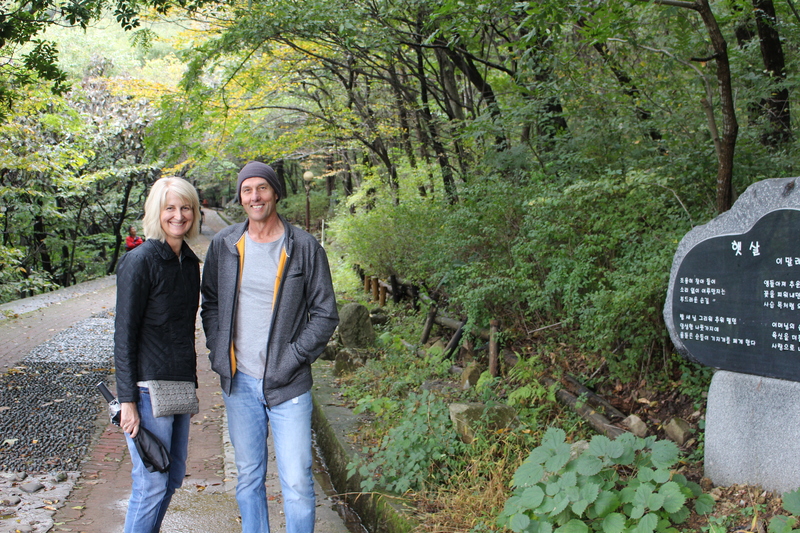 Being very tall and blonde meant that Jan and Paul had just about every Korean we passed calling out ‘hello’, smiling and waving. I’d like them to think I’d organised it that way, but it’s just the Korean obsession with blonde blue-eyed folk. Paul obliged Jan and me with a pee in the public toilet. 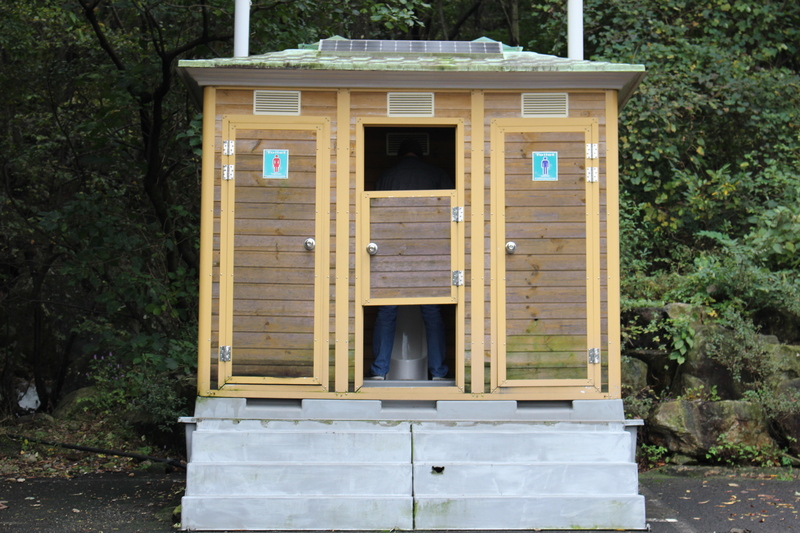 Okay, I realise how strange this sounds, but we just needed to be sure that tiny toilet door in full view of the public car park actually did hide all the man bits. You’ll be pleased to know it does. 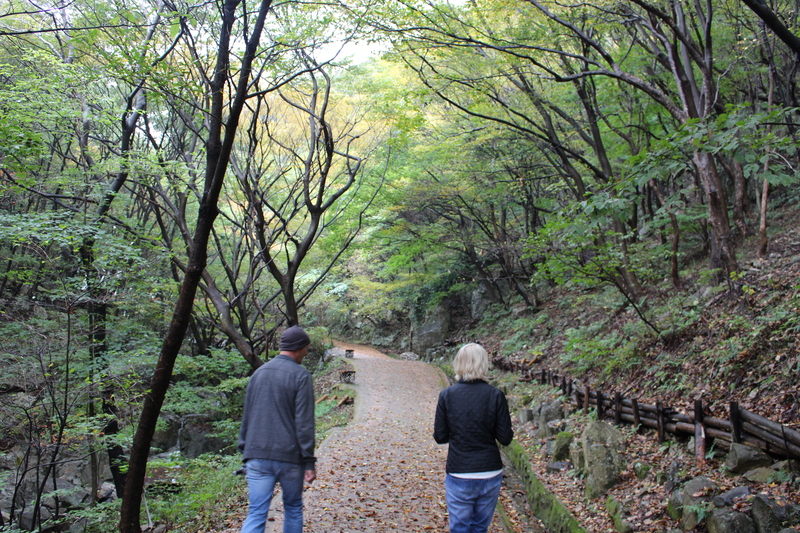 From here, we headed around to Deaymung Resort, which only opened this year. It features a huge water slide and park, outside glamping (Koreans are obsessed with their idea of glamorous camping), water views and a great restaurant. 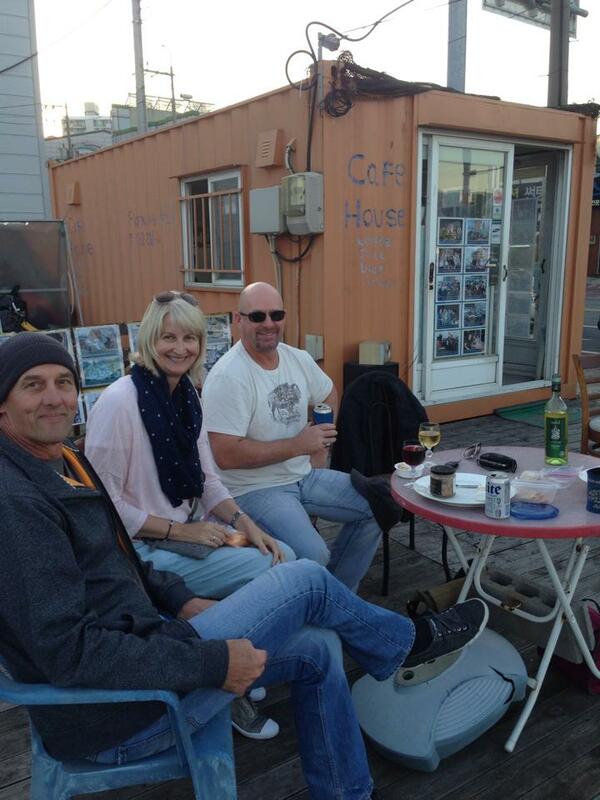 No visit to Deokpo Beach is complete without a beer at Waves, a weather beaten timber shack with decking and water front position. Naturally, we made it home by five for Happy Hour, Ricky Lee and Boz Scaggs. 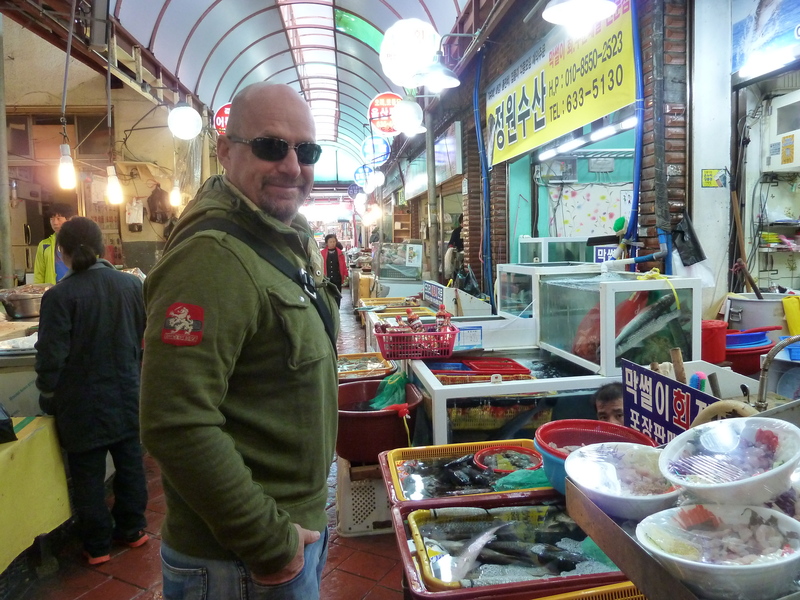 Now most would not be interested in a shopping centre but by day three, Paul’s fascination with food on a stick had really taken hold and HomePlus offers this on a grand scale. HomePlus is where I do a food shop once a fortnight. It’s a giant department store with food courts, supermarket, liquor, home wares and a cinema. Jan and I managed to buy furry clothes – she a zip up jacket and me tracky daks. We were totally decked out in some weird fuzzy warm foreign material. Only in Korea. 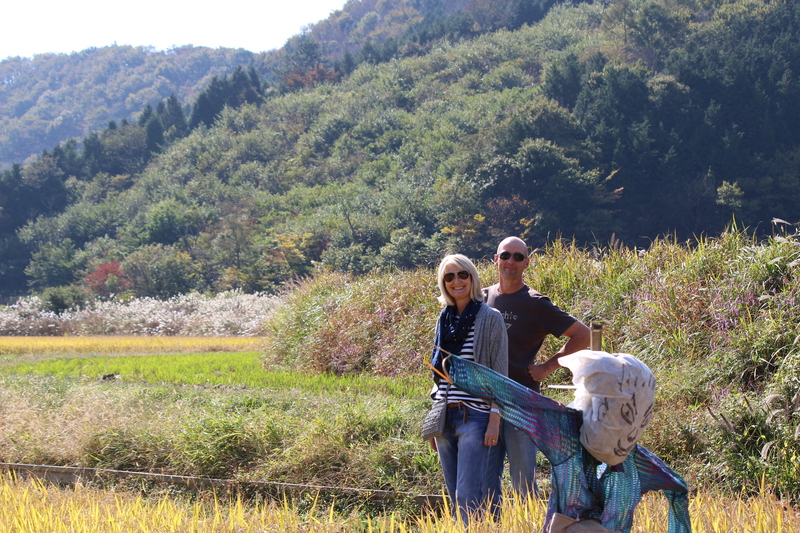 Once home, Jan and Paul went off in search of bibimbap, a local rice and meat dish. The hunt for weird and wonderful local food continued. 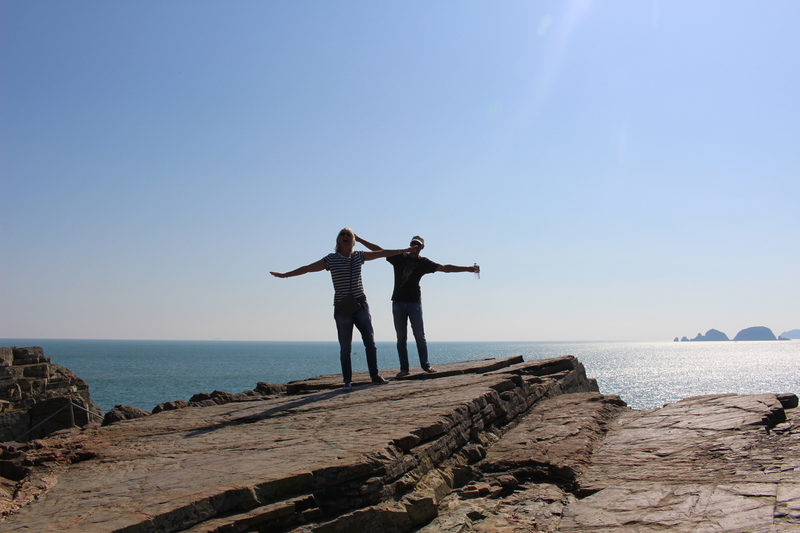 The weather was spectacular – blue skies, sunshine and the perfect temperature. 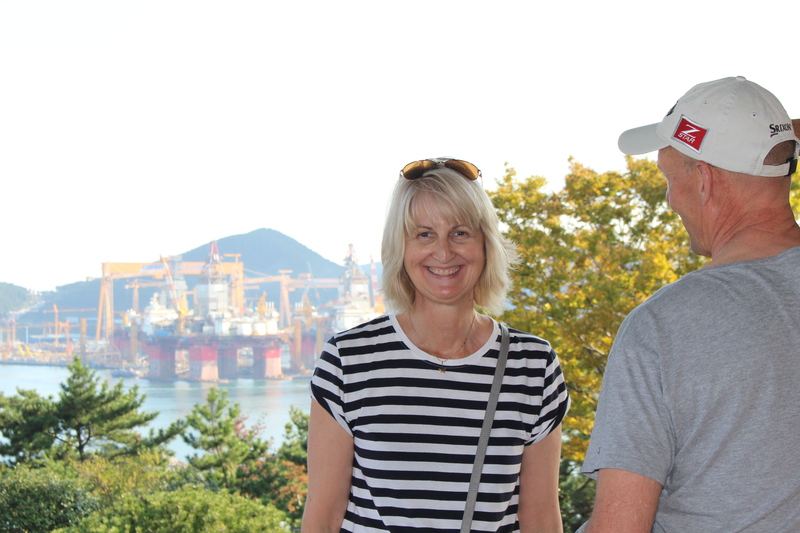 We spent the afternoon at the Okpo Great Victory Commemorative Park, which was built in 1996 to commemorate the victory of Admiral Yi Sun-sin in the 15-92-1593 naval battle against the Japanese. 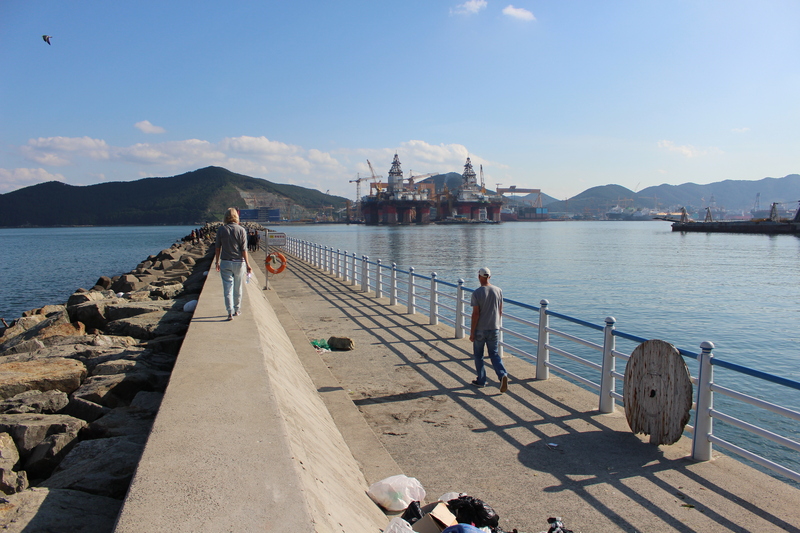 This also meant a stroll along the jetty adjacent to the shipyard to watch the many fishermen. Paul was invited by a local man who spoke no English to join him in eating fish literally just caught, and a nip of soju. 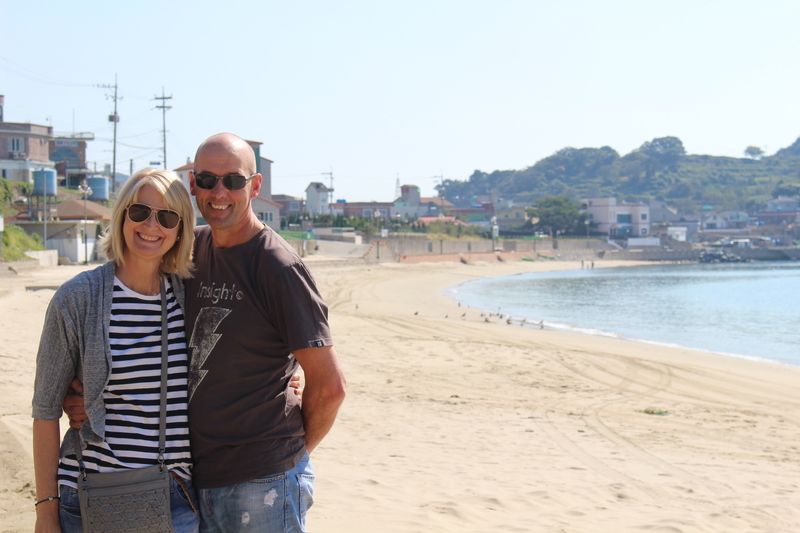 Naturally, Paul thought it would be rude to refuse, so whilst Jan and I were waiting on the next level up and taking in the stunning coastline, he was down below on the jetty, eating the local version of sushi and playing cultural charades. 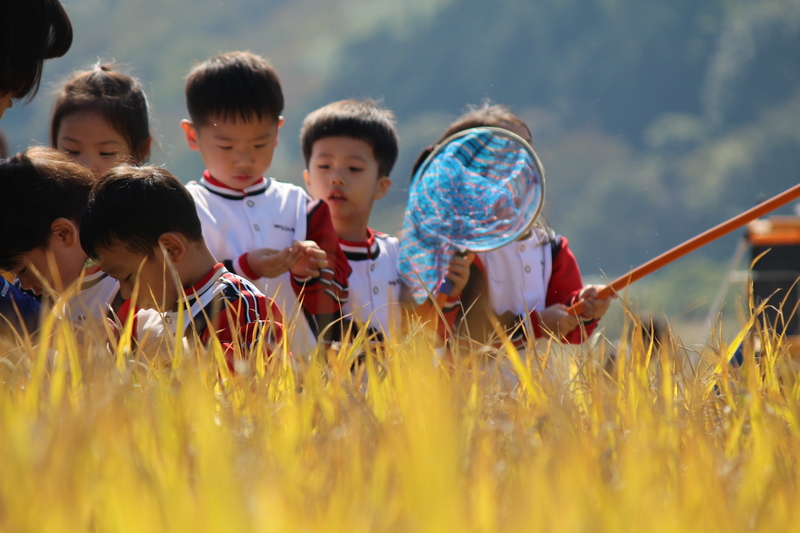 We took off around the island, stumbling across a rice field of children learning how to harvest and catch dragon flies in nets. It was probably one of the cutest things I’ve encountered. There was pure joy in such a simple activity. 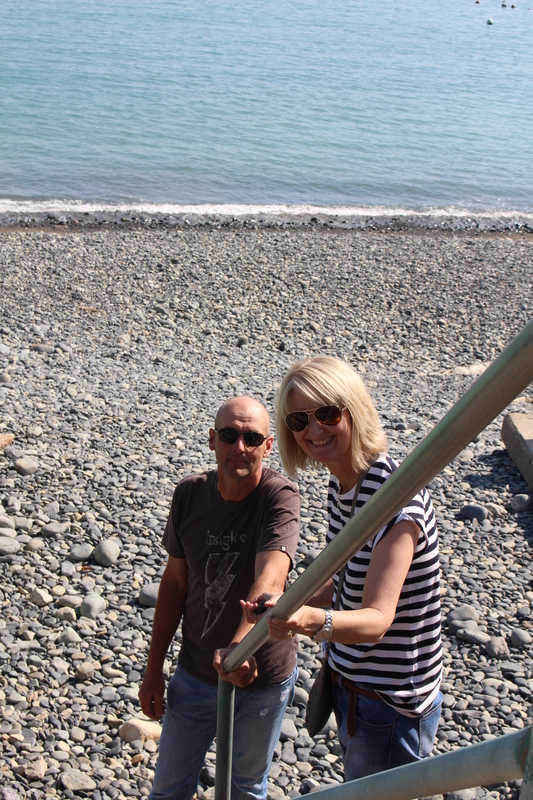 It was then onto Gajora Beach first, and Black Pebble Beach second, where we paused for a coffee at the CU. 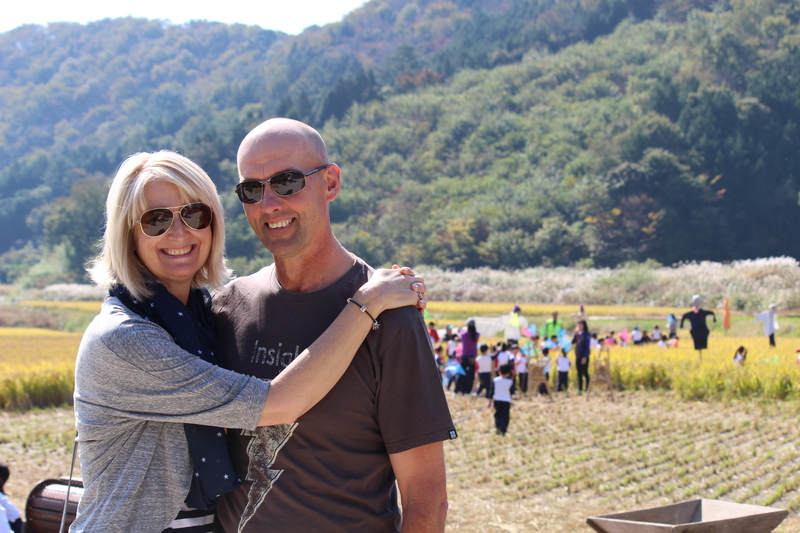 There’s a few things to note about a CU (Korea’s version of the 711). Firstly, they are open 24/7, and secondly, it’s often where you will find expats gathered outside sitting at plastic tables and chairs drinking beers that they’ve purchased inside (in our case, most often on a late Sunday afternoon). It’s cheaper than a bar and the CU’s encourage it. Our next stop was Windy Hill. 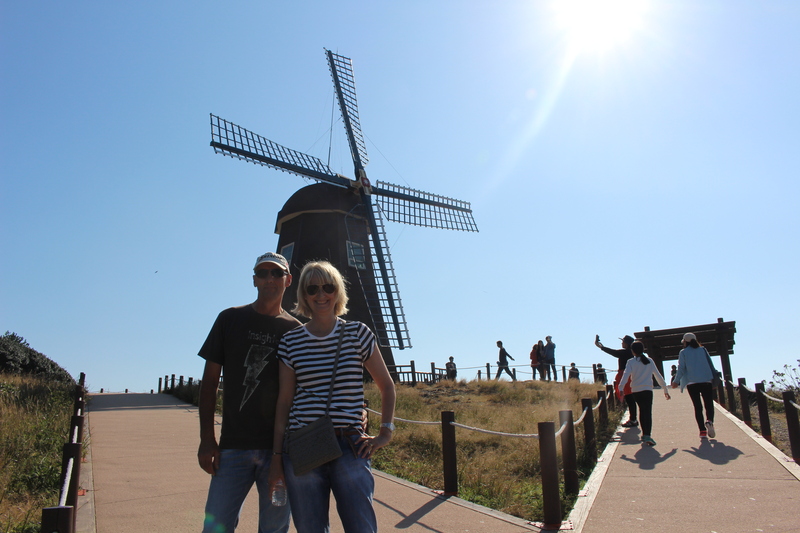 No one, and not even the guide book, is able to actually explain to me what the purpose of the windmill on the hill is. More importantly, no one is able to explain why it attracts literally thousands of people every weekend – they come in cars and buses as far as the eye can see. 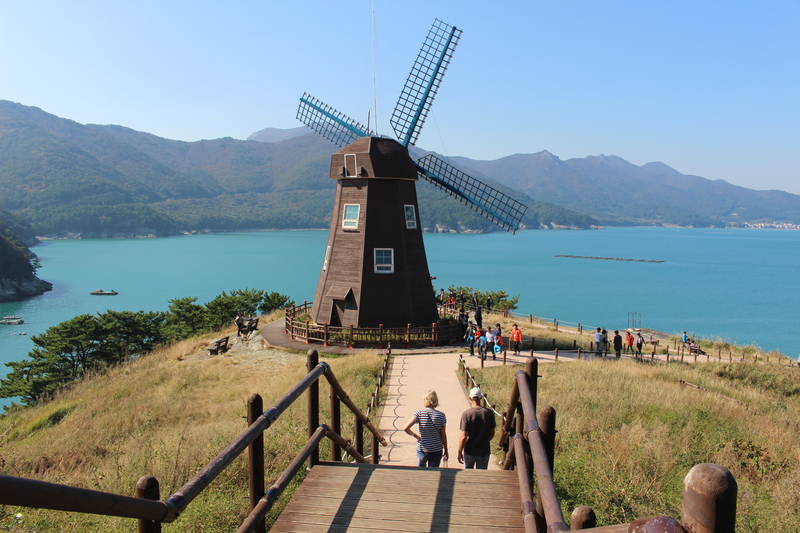 Certainly the coastline is spectacular (and almost reminiscent of a Greek Island harbour or two) but the Korean’s fascination with a windmill on a hill eludes me. 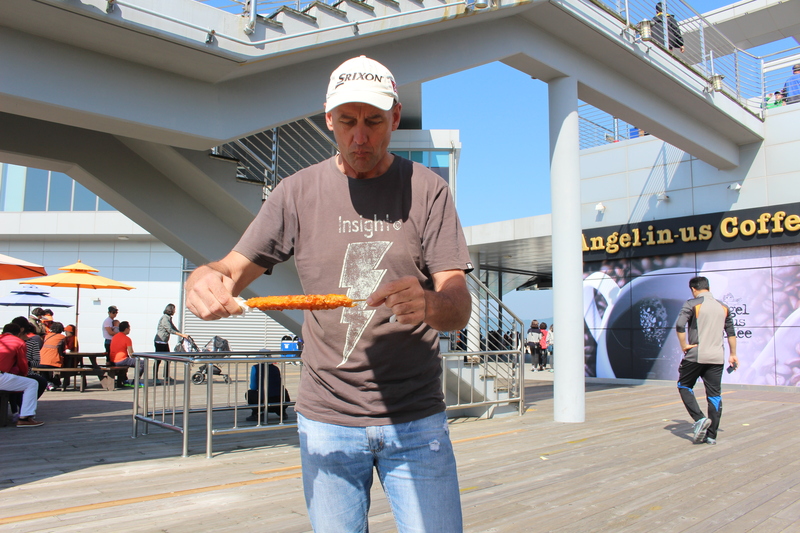 Of course, if you want to eat a ghastly hot dog covered in batter on a stick and smothered in sugar, then you’ve come to the right place. This treat sells by the hundreds at the base of the hill. So too, do the selfie sticks. Apparently Windy Hill is the centre of the ‘selfie universe’. 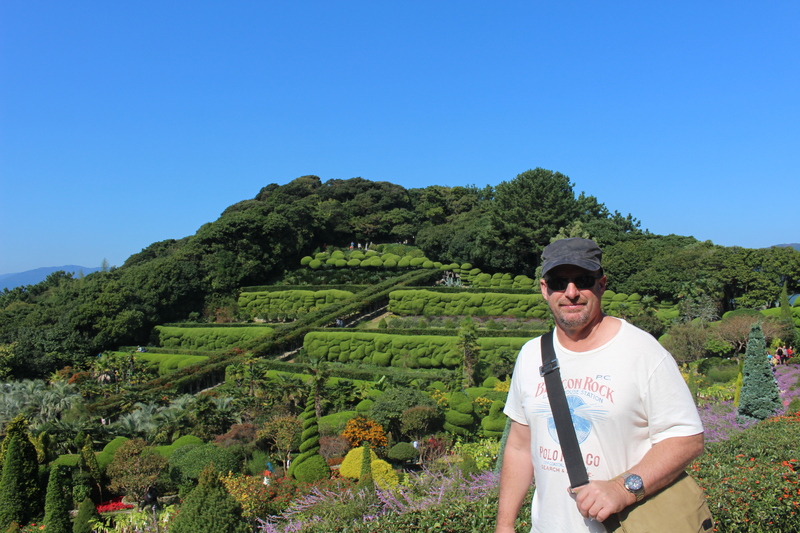 That said, no drive around the island is complete without a visit and a walk out across the other side onto the rocks. The coastline and view is just breathtaking. We had to wait for Rob to return from Ulsan so Happy Hour started at home and then moved to Dublin Square, a quaint Irish pub painted bright pink which seats about 25 people max, and our usual haunt on a Friday night (it helps that they sell white and red wine by the glass, most bars don’t). And the night would not have been complete without a ‘Men in Black’ ride home. This is a service offered to expats whereby you call a number and a man (typically dressed in a black suit, sometimes with glasses) comes running out of the night from somewhere and drives you home in your car for less cost than a cab. When you arrive, he simply disappears into the night. We have no idea where they come from or how they get back. 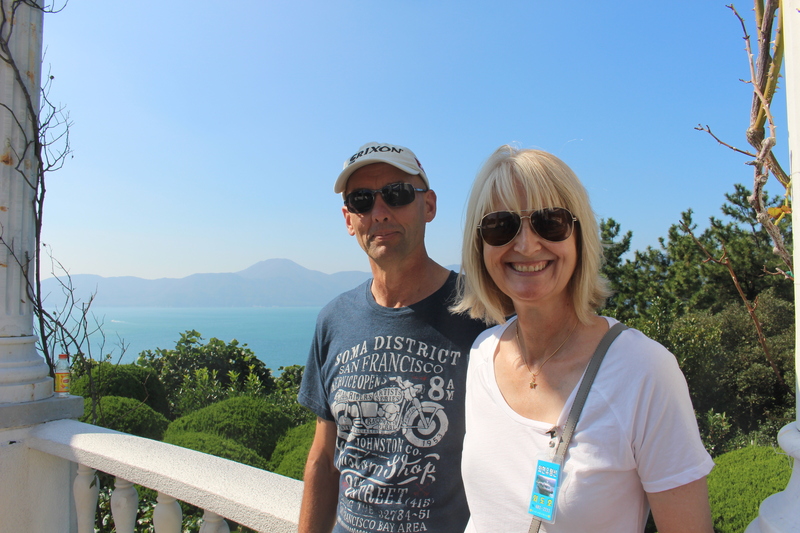 No trip to Geoje Island is complete without a drive across the bridge that connects the island with the mainland. The Busan–Geoje Fixed Link is an 8.2kms bridge-tunnel that connects the South Korean city of Busan to Geoje Island. The route opened on 13 December 2010 and shortens the travelling distance between Geoje Island and Busan by about 60kms. Built by a public-private partnership, the link features two bridges and one undersea tunnel. 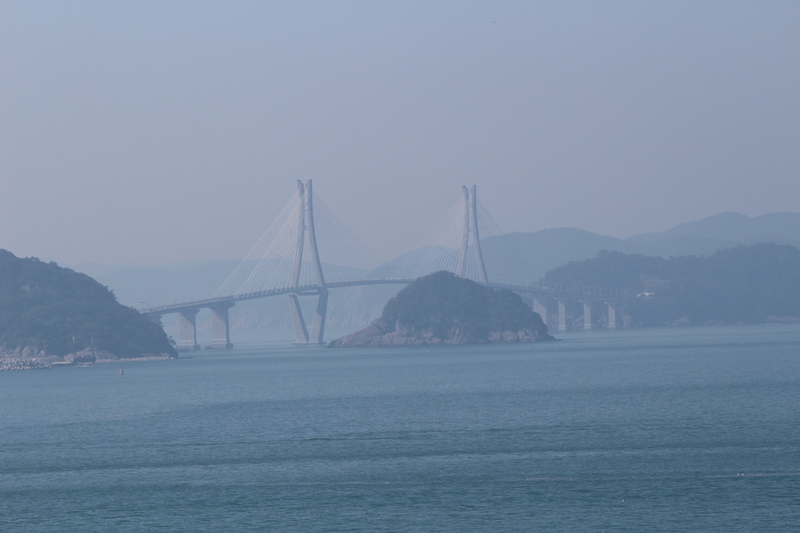 The first is a 1.87km long cable-stayed bridge between Jungjuk and Jeo islands. 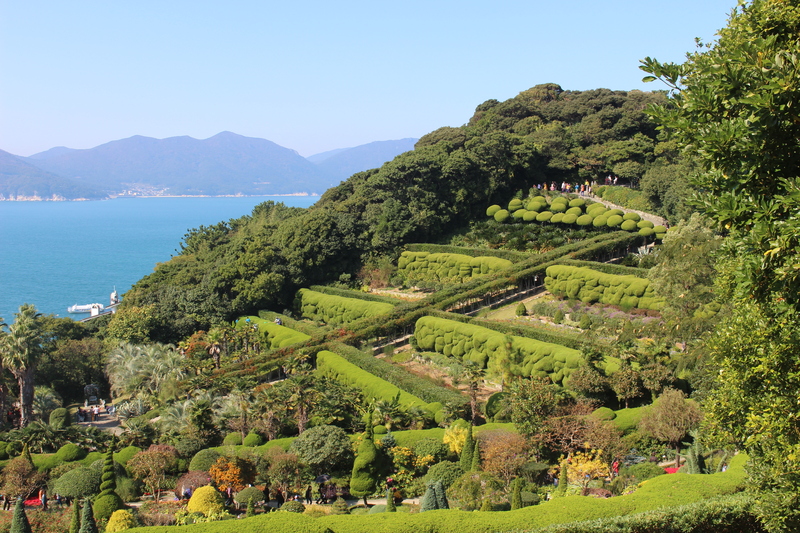 The second, between Geoje and Jeo islands, is 1.65km long. The undersea tunnel is made up of 180m segments constructed in a dry dock in Anjeon. Each segment was towed 35kms by barges and sunk into place. When it opened, the tunnel became the world’s deepest immersed roadway tunnel (48m below mean water level) and the world’s second-longest concrete immersed tunnel at 3.2kms. It is Korea’s first immersed tunnel – and absolutely freaks me out every time we drive through it. According to Rob, the best vantage point is from the ginormous roadhouse on the return journey (ie from the mainland to the island). For some time, he’s been waxing lyrical about how this roadhouse has to be seen to be believed. And he was right. There were more tour buses and visitors to this roadhouse than Disneyland on a good day. 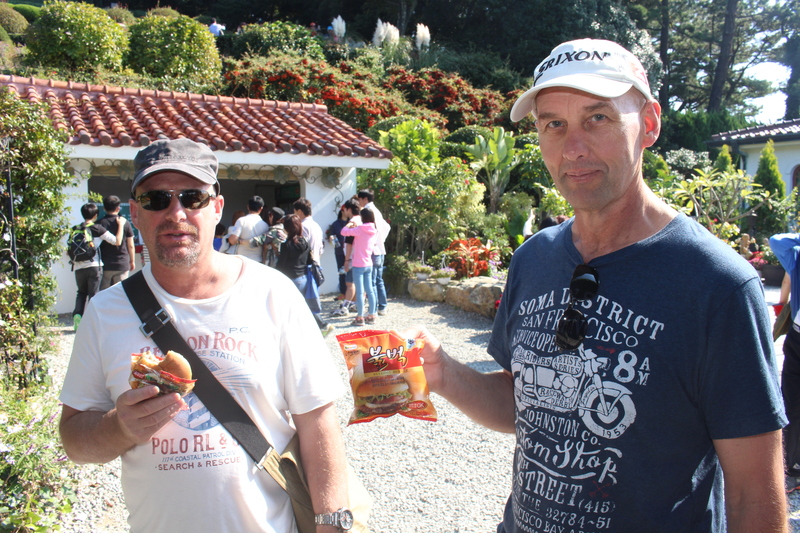 There were men selling all kinds of knick knacks from tented stalls (Rob purchased two fishing knives he assured me could not be found anywhere else in Korea and would last a lifetime…okaaay) and Paul purchased……you guessed it…….food on a stick. 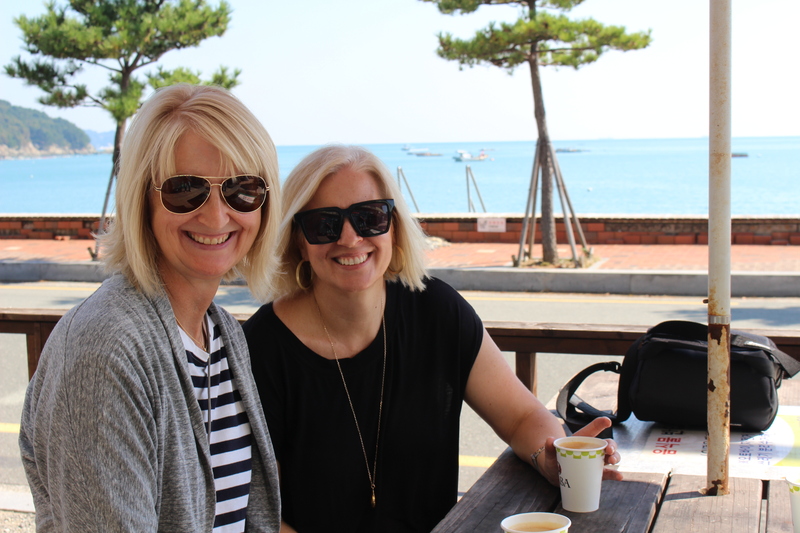 Whilst we sat and absorbed the sunshine and view, we could not help but marvel at the Korean dress code. Apparently, once 18 October hits, you trot out your tracksuits, coats, hats and scarves. We were in shorts and t-shirts. From here, we headed back to Geoyhan to the wet markets. I’m not going to lie. A trip to the markets can be rather traumatic for the animal lover, or really, anyone with a heart. You have no choice but to request live seafood to ensure it is fresh (the dead variety may have been sitting out for hours). To watch them scale the fish before it’s been killed however is rather distressing (although, I’m guessing far more so for the fish). This meant that whilst Rob purchased two live squid and had them slaughtered on the chopping board by the side of the road, Jan and I walked in a different direction. Yes, apparently ignorance is the answer to ceasing animal cruelty. We also came home with a bag of live, wriggling prawns which were promptly placed in the freezer to lull them to a less painless (albeit cold) death. Obviously we were quite shaken, because Jan and I took a nap whilst the boys weaved their magic in the kitchen. Jan and I emerged an hour or so later to a spotless kitchen and a picnic ready to go to the Container Bar. Here’s the thing about the Container Bar. It’s a sea container, plopped on a busy corner on a gravel patch with plastic chairs and tables. Mr Parks, who owns the bar, provides great music (Boz Scaggs did make the play list), takes your photo for the gallery wall and offers red and white wine. Not great red and wine white mind you, but out of a bottle nonetheless. 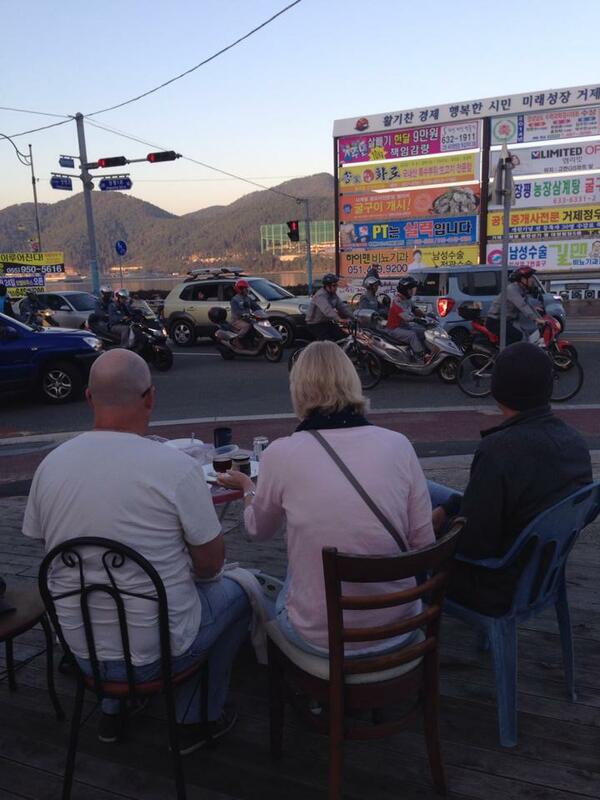 You can pack your own nibbles (as we did) and watch the crazy driving behaviour of hundreds of Korean workers leaving the shipyard on motorbikes. Kind of like drinks and a show. A ‘Man in Black’ took us home again. 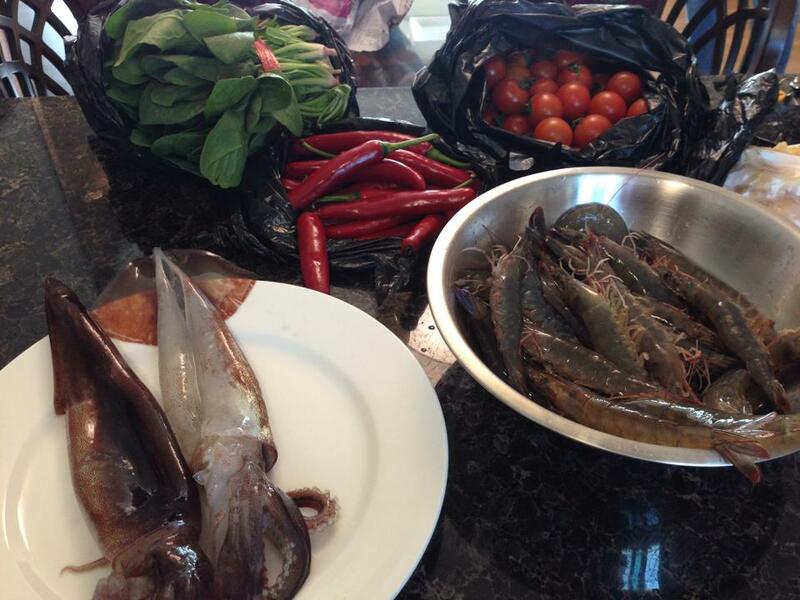 The boys cooked us seafood pasta. It was bloody yummy. Unfortunately animals were harmed in the making. 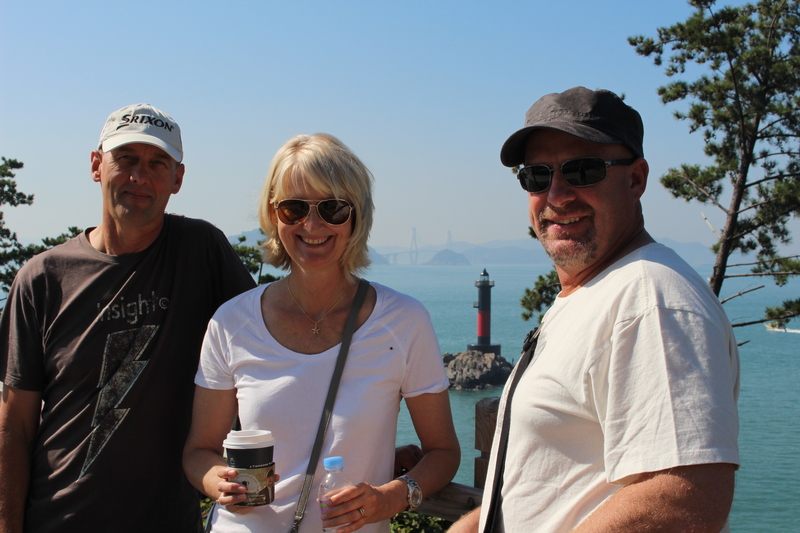 For the few days preceding, I had asked Rob a number of times if he knew how to get to the Jisepo ferry. Each time, I got an emphatic yes and a reminder that there was no need to seek directions from anyone else. I knew where Jisepo was, but just had not been specifically to the port. Long story short, Rob really didn’t know where he was going and refused to listen to me (okay, I was in the back seat), and he took directions from the GPS instead. What should have been a 20 minute drive, took an hour and poor Jan and Paul had to listen to us arguing over directions the entire way. The upside is that Rob has learnt his lesson. End of story (at least for the one with the power of the pen). 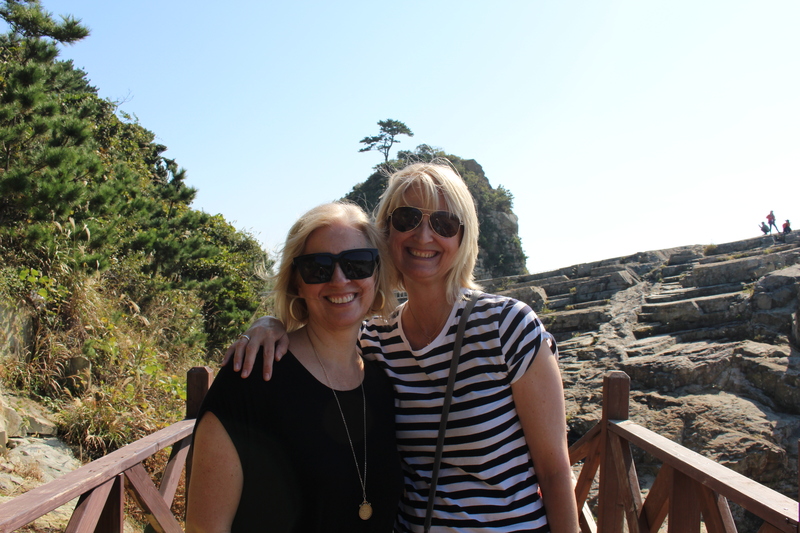 Eventually, we found it and took off on the ferry to Oedo Island, Korea’s first privately owned island and host to the Oedo Botanica. 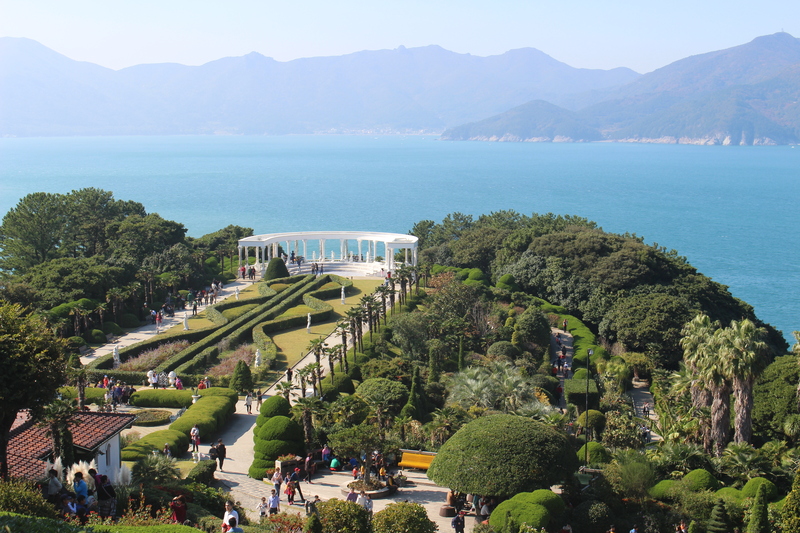 It’s somewhat of a cross between a botanical garden and one of East Asia’s infamous “country-themed parks” and designed to make you think you’re somewhere in the Mediterranean. 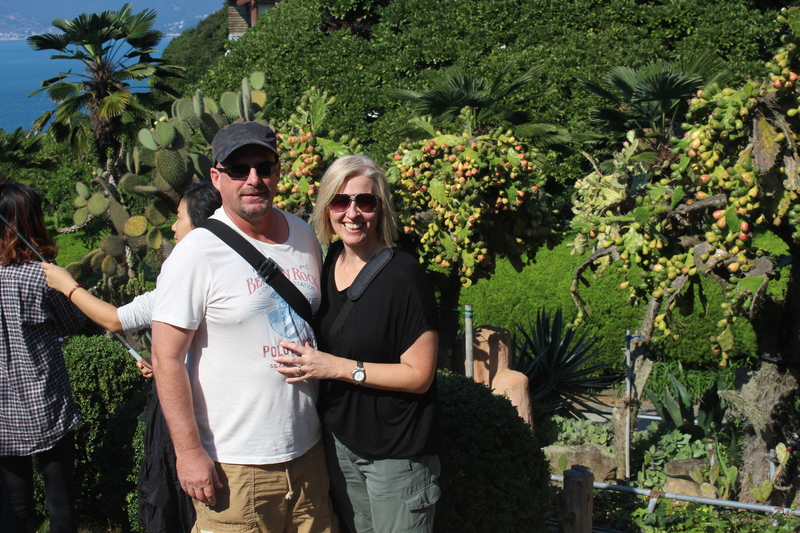 Beautifully landscaped and covered with greco-roman statues, the gardens follow a tight valley surrounded by sheer cliffs. 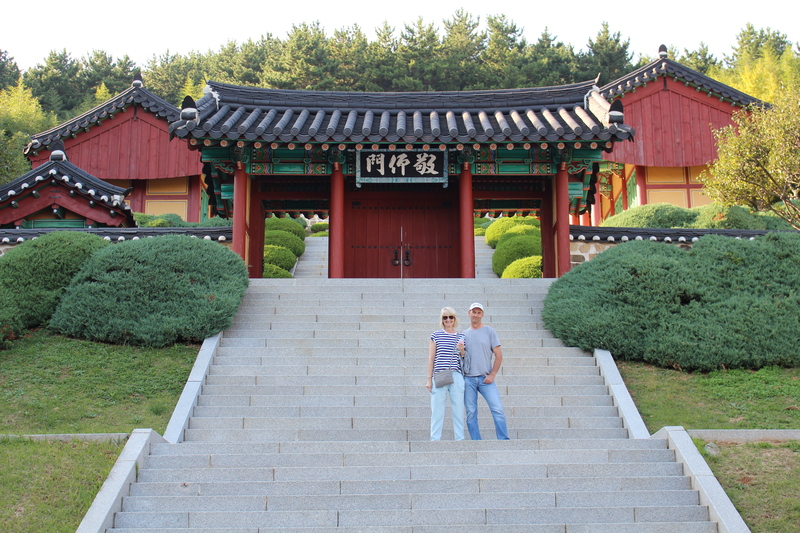 The gardens were created by a literally-penniless couple that crossed the 38th parallel after the war and were opened to the public in 1995. Whilst the boys ate food in a bag as we wandered (microwaved ‘instant’ hamburger), Jan and I were starving by the time we hit land again. 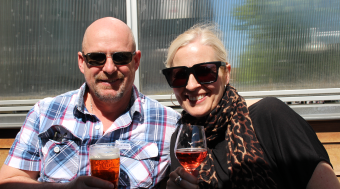 We took off for Okpo in search of food and settled on beers, wine, martinis and hot chips at Garage. Clearly, we take our visitors to all the classy joints on the island. And as I waved my aunt and uncle off on Monday morning, I again had to fight a tear or two. Afterall, it’s not everyday you have your old world in your new. 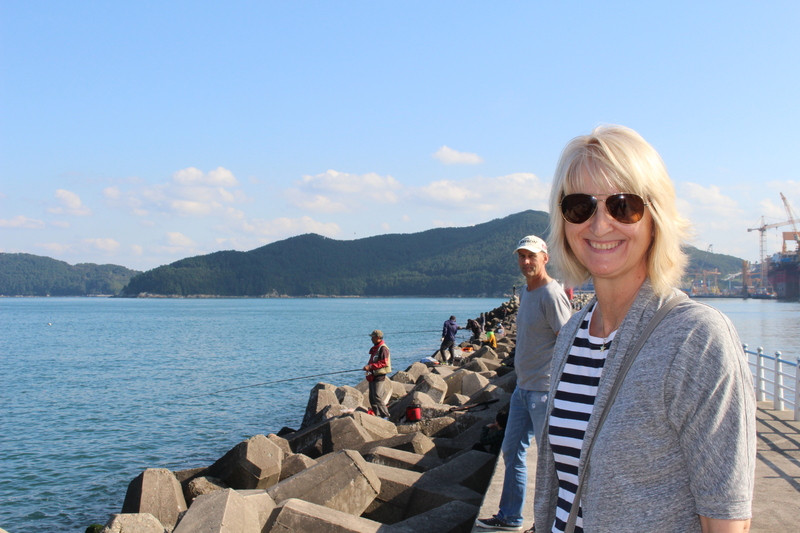 The city known as Geoje, meaning ‘treating others with kindness’ or ‘providing great rescue’ is located on the south eastern tip of Korean peninsula. Comprised of ten inhabited and 63 uninhabited islands, it contains Korea’s second largest island. 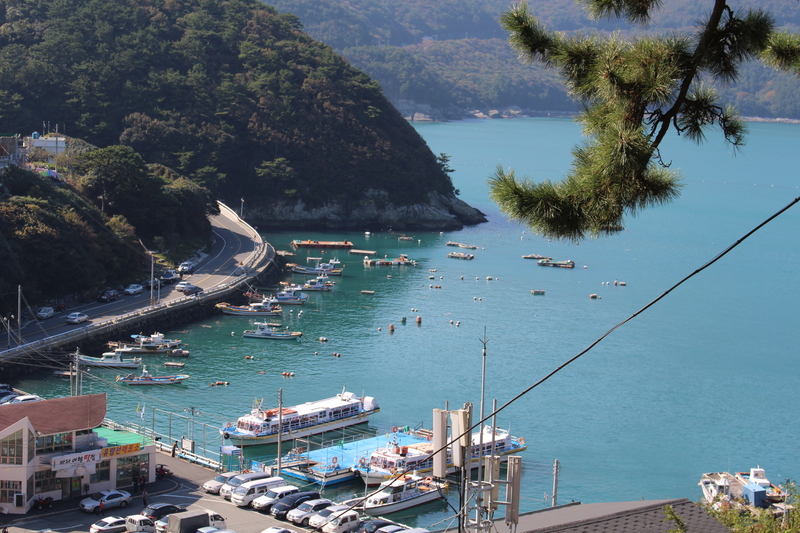 Dubbing itself the “Blue City”, Geoje is not so much a city but an island — Korea’s second largest after Jeju – and a loose collection of villages and settlements scattered in coves around the coastline. The two largest of these are Okpo (옥포) on the east coast and Gohyeon (고현) on the west. 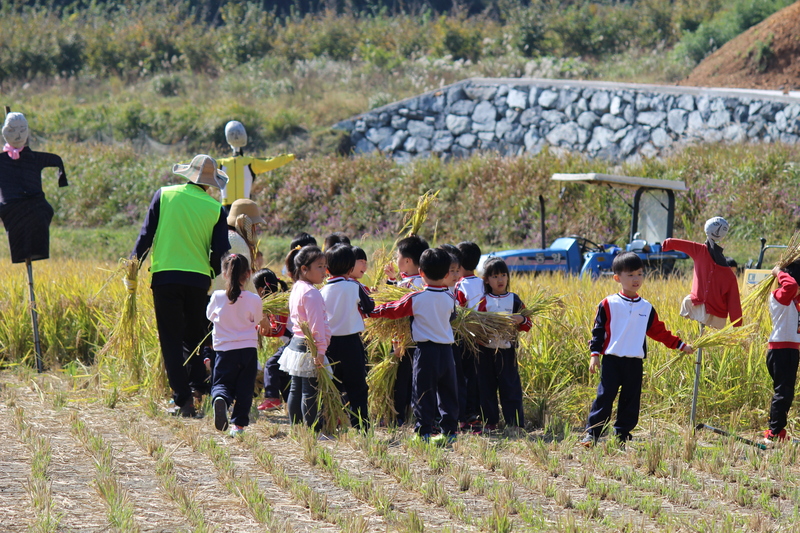 We live in Suwol which is situated about ten minutes’ drive out of the main centre of Goyheon and about twenty minutes’ drive to Okpo. 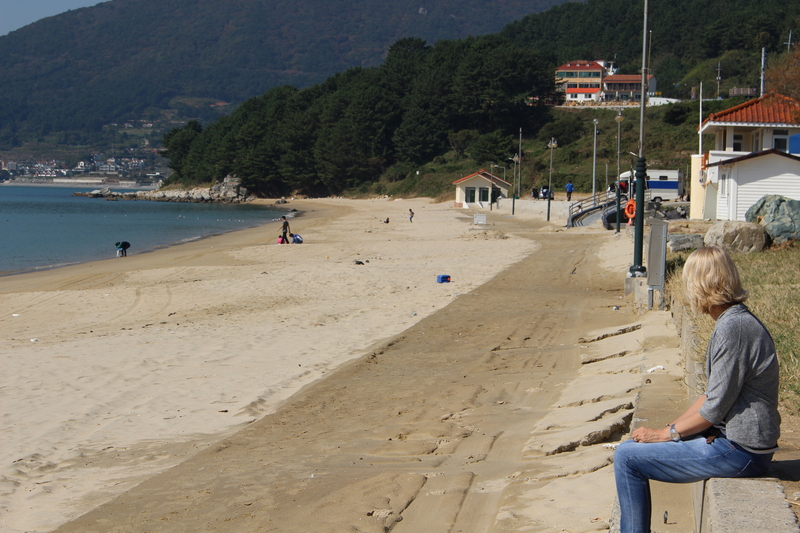 Most of the tourist sites lie between these two settlements around, and just off, the southern coastline. The intercity bus terminal is in Gohyeon. The key attraction of the island is its natural coastal beauty. Outside of the two cities it is a near-endless series of calm blue beached coves and sheer pine-forested grey cliffs overlooking the sea. Geoje actually has a significant role in Korea’s naval history. The coast of Okpo is the setting for one of Korea’s greatest military victories over Japan, during early stages of the 1592-1598 Imjin War. United under Admiral Yi Sun-sin, Korean armour-plated turtle ships successfully repelled Japanese attackers from taking the Jeolla region. Although this ultimately did not stop the war in its tracks, it did slow the invasion a little and provide a morale boost to the nation. 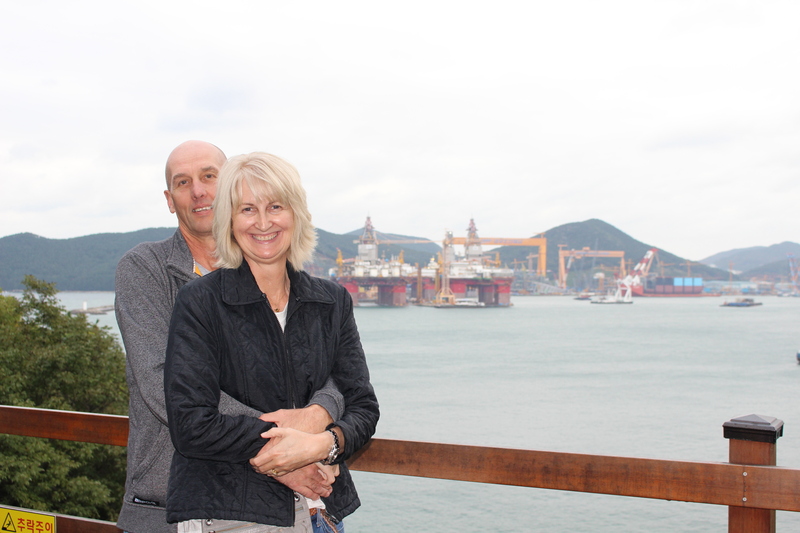 Today, Geoje is a shipbuilding powerhouse hosting both Samsung and DSME shipyards. Despite the large number of foreign residents employed to supervise these facilities and subsequent notably high foreign presence in Okpo and Gohyeon, English signage on the island varies between minimal and non-existent. Prior to December 2010, access to Geoje was limited to ferries or over the one bridge connecting to the mainland at Tongyeong. With the completion of the dual bridges and tunnel that comprise the Busan-Geoje direct expressway link, access by both express bus and car has been made significantly faster and easier. Population is close to 250,000 with an almost 50:50 split of male and female residents. Nearly 30% of residents are expats. Soju is Korea’s most well-known alcoholic beverage and most brands of soju are made in South Korea. 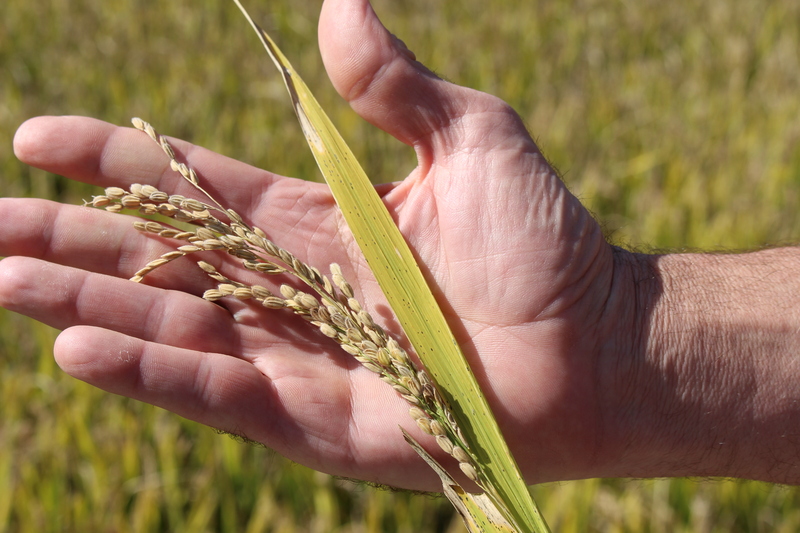 It is traditionally made from rice, wheat, or barley and is a distilled beverage containing ethanol and water. It is usually consumed neat. Soju is clear and colourless. Its alcohol content varies from about 16.7%, to about 45% alcohol by volume (ABV) with 20% ABV being most common. Surprisingly, a typical 375mL bottle of soju costs the consumer only 1,000 to 3,000 South Korean won (roughly $1 to $3 Australian dollars). 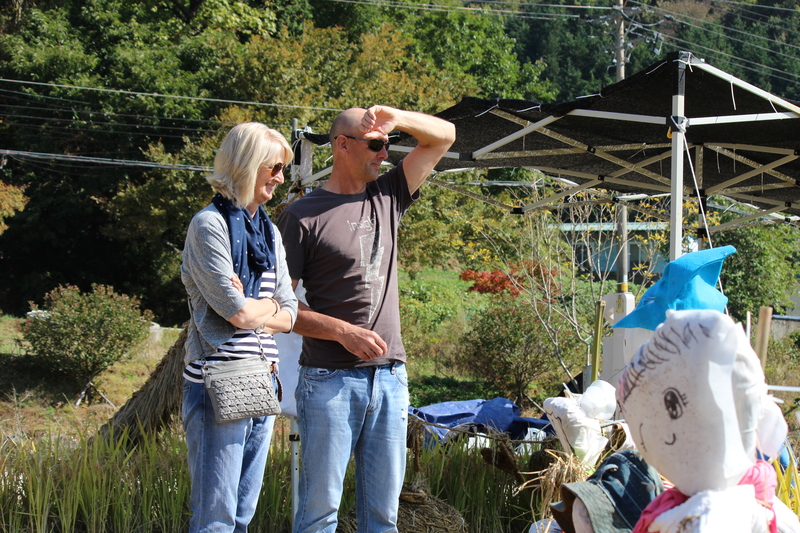 Korea has a very strict culture of respect and etiquette. When receiving a glass from an elder, one must hold the glass with two hands (left palm on the bottom & hold the glass with right hand) and bow the head slightly. When it is your turn to drink, turn away from the elder and cover your mouth and glass with hands. If you are pouring a glass for others, hold the bottle with your right hand and support your right arm with your left hand by touching its elbow. 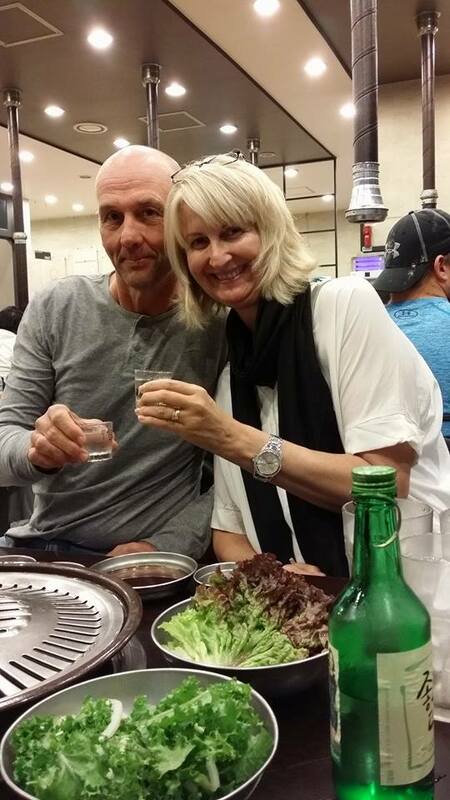 There are a few rules unique to Soju: never pour your own, and don’t refill your glass until it’s empty. Both rules, we’ve failed miserably on! Next When Snowy came to visit, there were three Korean lessons. Another fab blog my dear. We will have to do some serious hunting on the map to find little places you haven’t been to as yet.. I’m thinkint that we start with anywhere that has a bar ha ha. 47 days and counting! Looking forward to witnessing my first fish murder! The meat on a stick i’ll leave to Rob! Just love reading your blogs.. I know it may take me a while to get to them but it is only coz I want to savour all you have to say.. I really do feel that I’m there with you… in spirit .. at least! 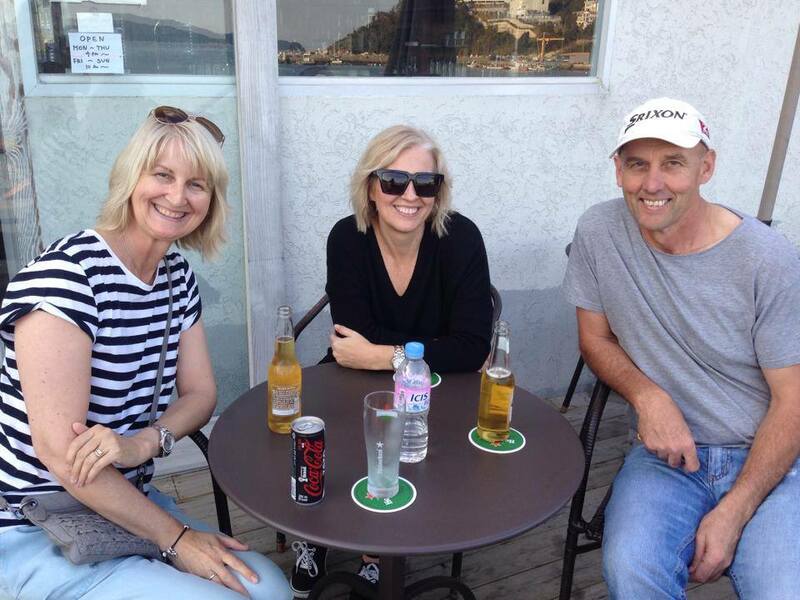 Sounds like you had a fabulous time with your Jan and Paul! 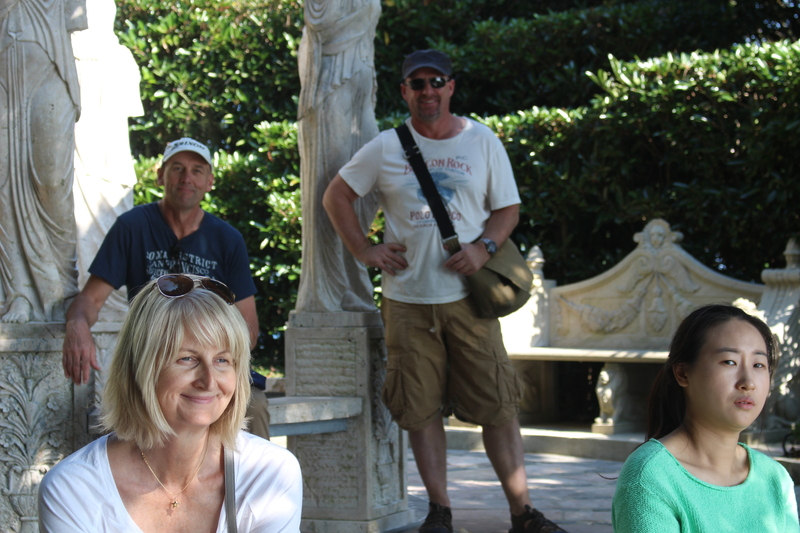 Lucky them oi have such fabulous guides!